Allowing agents to infiltrate media organizations for any reason threatens to utterly undermine public trust, kill the very concept of journalistic integrity, and throttle the flow of information from sources and whistleblowers concerned with the legitimacy of journalists they contact. As shocking as the finding sounds, it only validates the practice — in fact, the report centers around a case from 2007 in which an FBI agent pretended to be an Associated Press journalist to identify an elusive suspect online. At the time, the FBI “did not prohibit agents from impersonating journalists or from posing as a member of a news organization,” the report states. But even the ubiquitous, mainstream AP — whose outlet became an unwitting pawn for the agency — sharply criticized the DOJ’s announcement. In 2007, a high school student near Seattle emailed a series of bomb threats to his school, but his use of proxy servers thwarted police efforts to learn his identity — so they asked for assistance from the FBI’s Northwest Cybercrime Task Force. When the student followed the links, malware revealing his actual location installed itself. It wasn’t until an ACLU technologist accidentally discovered copies of the bogus news stories in 2014 — buried in pages the Electronic Frontier Foundation obtained from the FBI via a Freedom of Information Act request in 2011 — that the plot to pose as journalists came to light, generating massive controversy and consternation. A review was launched by the OIG, but Thursday’s conclusion simply confirmed the FBI’s previous finding it had done nothing wrong — and may proceed with future journalistic deception. In June this year, the FBI firmed up its rules for when an agent can pretend to be a journalist — but the added rules haven’t quelled the ire. As long as agents receive approval from the head of the FBI field office, the Undercover Review Committee, and the deputy director of the FBI — who then must meet with the deputy attorney general — they are free to pose as journalists during undercover investigations. “We believe the new interim policy on undercover activities that involve FBI employees posing as members of the news media is a significant improvement to FBI policies that existed,” states the inspector general. But no one outside the FBI or DOJ’s Office of Inspector General who grasps the grievous threat to free speech and press — or the potential slippery slope law enforcement co-opting the media represents — agrees anything short of an abolishment on the practice could be acceptable. “The FBI guidelines adopted in 2016 in response to this incident still permit the FBI to impersonate news organizations and other third parties without their consent in certain cases, and fail to address the host of other dangers associated with FBI hacking,” Neema Singh Guliani, ACLU legislative counsel, said in a statement cited by US News. 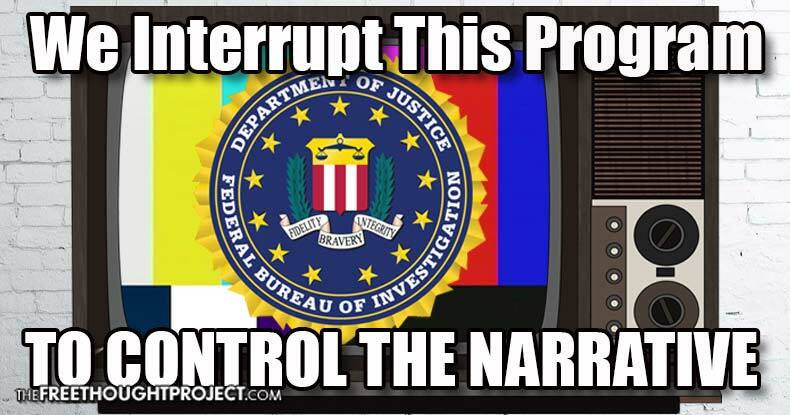 Anyone with cursory knowledge of the U.S. government’s nefarious programs to control its citizenry will undoubtedly see similarities between the FBI’s fake journalism plot and the post-World War II CIA propaganda campaign, Operation Mockingbird. To ensure support for its operations and views, the CIA clandestinely recruited American journalists and media outlets, funded the creation of student and cultural organizations, launched purely propaganda-based print media, and, ultimately, worked its way into political campaigns and employed similar methods abroad. Mainstream outlets like the New York Times, the Washington Post, CBS, and many others, actively and willingly disseminated propaganda disguised as news — through suppression, censorship, and selective focus, etc. — in the interest of the government. Mockingbird covertly influenced national opinion for years, nefariously planting the CIA’s narrative on the unwitting collective public mind before finally being at least partially exposed over a decade later. It wasn’t until a congressional investigation in 1975 the putative full extent of the program was revealed. Although the CIA claimed it would no longer recruit journalists and media organizations into its folds, Mockingbird has oft been rumored never to have stopped. Besides the revelations in this article concerning the FBI, documents revealed the government actively tried to influence public thought about Wikileaks and its founder, Julian Assange, in 2011. It would seem Mockingbird endures to this day — and whatever premise the government claims as reason to become the American media — the public remains, for the large part, its oblivious, captive audience.